Tim Jones attended Durham University in northern England, where he studied geography and geology, graduating with a BSc in 1987. He worked on the first ‘Important Bird Areas in Europe’ inventory for the (then) ICBP and IWRB, based at Slimbridge, UK, and subsequently as a Research Assistant for WWT, before returning to IWRB as Ramsar Liaison Officer. From 1994 to 1999 he was the European Regional Coordinator for the Ramsar Convention, based in Gland, Switzerland. He became freelance in 1999 and returned to the UK in 2000, establishing DJEnvironmental with Tim Davis. 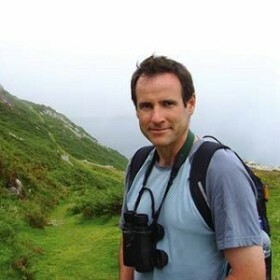 Tim Jones has worked in many countries for a wide range of clients including BirdLife, IUCN, Ramsar, UNEP, Wetlands International, WWF, providing strategy and policy advice, as well as a highly regarded reporting service for international environmental meetings, including Ramsar & CMS COPs and AEWA MOPs. Away from professional commitments, Tim is a passionate naturalist and horticulturist, with a special enthusiasm for the island of Lundy off the coast of south-west England.